If we consider the CTE, in the DB-SI, the exterior propagation on covers paragraph, Part 2, says: “In order to limit the risk of external fire spread across the deck, either between two adjacent buildings, either in the same building, this will have a fire resistance REI 60, at least in a strip of 0.50 m width measured from the adjacent building…” But here there is a clear problem, covers for industrial establishments are not normally REI 60. Perhaps the supporting structure is R-60, but not the area between frames. It is possible to make this stretch EI-60, but it can be very complex because it makes no sense to try a strip bearing capacity -R- because these items have neither bearing load capacity nor they require. Trials to ensure the bearing capacity of an element are made with fire distributed loads. 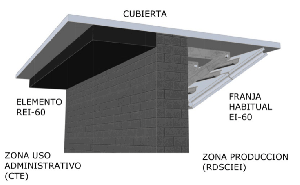 If instead we consider the RDSCIEI, it says: “When a partywall or a constructive sectors partitioning element charge the deck, the fire resistance will be at least equal to the half of the required constructive element in a strip whose width is equal to 1 m.” Later we refer to a test conducted by a Firewall partywall-cover protocol test “in which insulation and -EI- integrity criteria are evaluated, but never the Bearing Capacity. In this case the gutter was EI-120 and EI-strip should be 60. This is what is usually done and has more sense than the above in the CTE.